Someone flips the Simpson family (as cards) on to the couch. "Kiss Kiss Bang Bangalore" is the seventeenth episode of season 17. "The Springfield Nuclear Power Plant is moved to India and Homer is chosen to work at the Indian plant, but with all the things he gets, he thinks he's a God." Homer learns that the nuclear power plant is being shut down and outsourced to India. Homer is the only employee who will work at the Indian plant, while all of the others are fired. Meanwhile, Patty and Selma meet their Hollywood heartthrob, MacGyver (Richard Dean Anderson), only to find that he is totally uninterested in MacGyver. Meanwhile, Homer realizes to his horror that he has come to India (which he previously mistook for Indiana and Illinois, simultaneously). 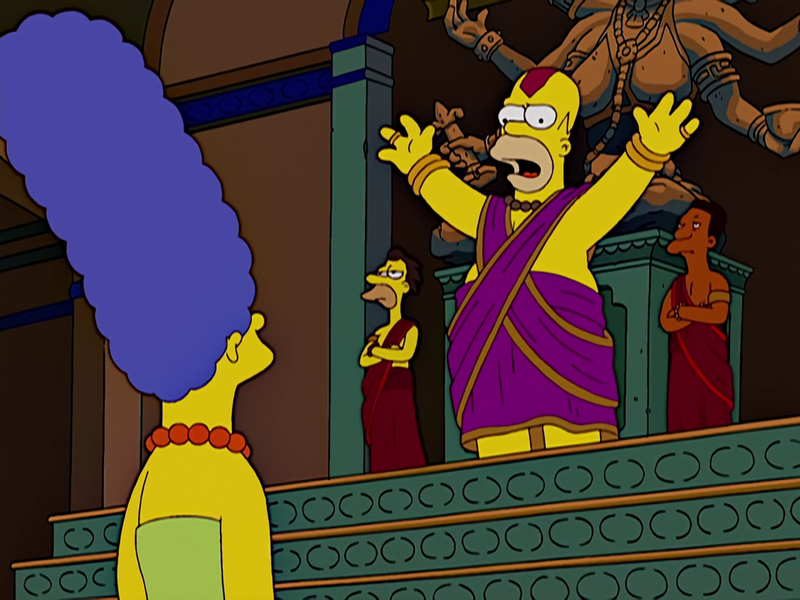 After a brief standoff with a sacred cow, Homer looks for a relative of Apu, who should be around here somewhere. After randomly asking people (for three seconds), he ("Finally!") gets the right man on the second try. Back in Springfield, Patty and Selma kidnap Richard Dean Anderson from his Stargate SG-1 convention and tie him to a chair. From there, he manages to escape... only to discover that he loves escaping, and starts having Patty and Selma put him through increasingly complex MacGyver-esque kidnapping trials. In India, Homer is coming to love the concept of outsourcing. With "help" from a book Marge gave him to read on the plane trip, The Cereal is the Prize, Homer is able to spur the natives into a working frenzy. Or so it appears; actually they assume that if they cheer, they will be allowed to go back to work. Homer, Smithers and Mr. Burns get a positive (if inaccurate) impression from this, and Homer is put in total charge of the power plant while Mr. Burns takes time off to have fun floating down the Ganges. Homer, left in charge of a slightly-overgrown nuclear power plant on a river in the middle of nowhere, appraises the Hindu deities and decides he might be a god. Soon, Mr. Burns and the rest of the Simpson family travel upriver on a PT boat in an Apocalypse Now manner, and find that Homer is ruling the plant like a god. Horrified, Marge tells the plant workers that Homer is not a god. They cheerfully explain that they know, and are worshipping him instead for the American workplace routines he has installed, like coffee breaks. Mr. Burns, enraged, fires everyone and decides to move the plant back to Springfield. This makes the workers ecstatic due to the various firing clauses Homer has written into their contracts. The episode ends with the Simpsons, Lenny, Carl, Patty, Selma, Richard Dean Anderson and Mr. Smithers joining native dancers in a musical party in the plant, for which the audio continues into the credits. Modified on January 22, 2018, at 19:20.